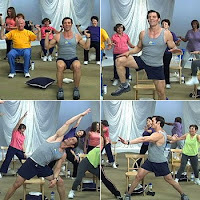 Tony states that in part he created this workout for his parents and their friends. He wanted to create a workout to help those between 50 and 80 to get some light exercise into their life. Tony finds a good balance between getting people moving and not pushing too hard. The workout is under 40 minutes. Tony states if someone is not working hard enough after once through to do the two circuits again. He also says if they are great after that they might be ready for some of his other products, Power 90, or Power Half Hour come to mind. Overall I would say he has met his goals and created a good starting point for seniors who want to get more active, and he has a lively bunch of cohorts doing the workouts with him.